Best Anime Like Naruto - Anime Recommendations '+g+"
Naruto and Naruto Shippuuden are one of the most popular shounen anime series in the world that follows the story of an young underachiever ninja's fun filled adventurous journey to becoming the Hokage - the strongest ninja of his village to gain the trust and respect he deserves. 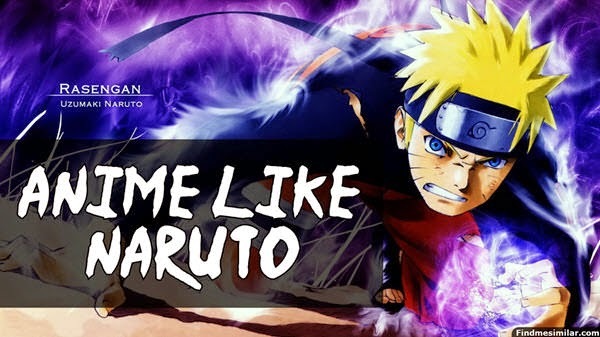 If you love Naruto like me and looking for more anime suggestions like Naruto or Naruto Shippuuden with lot of awesome fights and good character developments then check out the below list of recommendations for other anime similar to Naruto. Our collection have 25 great anime like Naruto out of which I'm sure you'll be liking at-least 10 anime that are similar to Naruto. One Piece is a story of a young teenager Monkey D. Luffy, who sets sail into the oceans to become the King of Pirates and discover the treasure of all treasures popularly known as 'One Piece'. It has a lot of similarities to Naruto like both main characters looks dumb and funny but when required they show extraordinary courage and talent. Both Naruto and One Piece are great shounen anime with strong friendships, never give up attitudes, over the top battles, amazing super powers and an adventurous journey to fulfill their dreams. If you like Naruto chances are that you'll surely love One Piece. Bleach is another action anime similar to Naruto. The anime follows Ichigo Kurosakia, a 15 year old teen with an ability to see spirits and ghosts. One day he becomes Soul reaper as Rukia Kuchiki a Shinigami transfers all her powers to him in order to defeat a Hollow. But when the Soul Society learns about it they sentence Rukia to death. In order to save her Ichigo along with his friends sets out on a journey to Soul Society and fight against the strongest Soul Reapers their. Hunter x Hunter is a shounen anime wit a lot of similarities to Naruto. The main characters of both series are young optimistic boys with a lot of determination and will to fight for friendship. The anime follows Gon Freecss a young boy from Whale Island who decides to become a Hunter to find his missing father. In order to become a Hunter he must pass the Hunter Examination during which he become friends with Killua, Kurapika and Leorio all wanting to become a hunter with their own reasons. Fairy Tail is an action-adventure shounen anime with a similar atmosphere like Naruto with an extra dose of humor. Both anime talks about friendship and shows the main characters being silly, impatient and powerful, they go on different quests with friends to earn money and also they fight against other guilds/villages. Dragon Ball Z is also one of the most popular shounen anime like Naruto that follows the adventures of Goku who must protect the earth from a variety of super villains like aliens, powerful androids and magical creatures along with his friends. Both have many similarities such as awesome battles, character developments, super powers, humor and many more. JoJo's Bizarre Adventure,...thinking of any other anime like Naruto that should be in this list? Just mention those similar anime in the below comments as we update them regularly.